A dog with an active heartworm infection. Microscopic larvae are produced by adult worms and circulate in the blood. 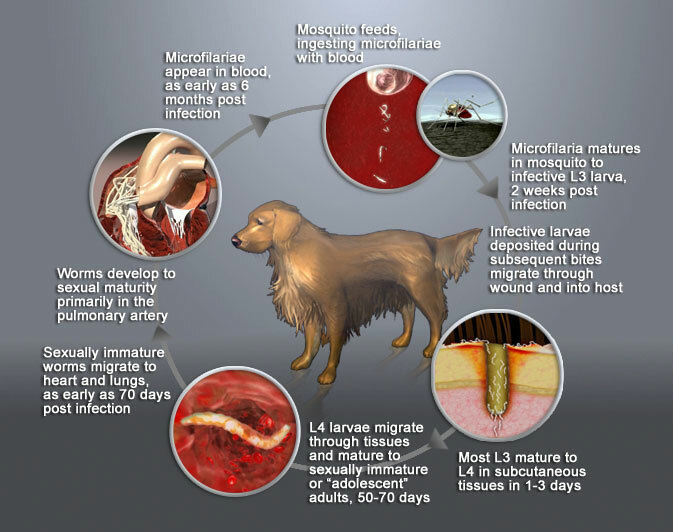 Larvae appear in the dog’s blood about 6 to 9 months after infection. CAPC’s recommendation for year-round heartworm protection and annual testing is more important than ever to ensure dogs and cats are protected — no matter where they live or travel. Illustration Credit: Courtesy CAPC. Salem, Oregon — The Companion Animal Parasite Council (CAPC) has issued the CAPC Top 10 Cities Heartworm Report reflecting positive heartworm test results from the last 30 to 45 days. According to a CAPC press release, Cincinnati, Ohio, topped the list. CAPC is an independent group of veterinarians, veterinary parasitologists, and other animal health care professionals that creates guidelines for controlling parasites that threaten the health of pets and people. CAPC launched its new monthly report initiative to alert pet parents, veterinarians, and pet-related service providers about U.S. metropolitan areas experiencing the highest percent increases in positive heartworm tests in dogs and cats. Pets in cities on this month’s CAPC Top 10 Cities Heartworm Report may have been exposed locally or travel-related exposure may have been a contributing factor to the increase in positive tests. Other factors include transporting of shelter dogs, pet owner compliance in administering monthly heartworm preventatives, changing weather patterns and mosquito microclimates. In addition to the cities in CAPC Top 10 Heartworm Report, many other communities also are experiencing increases in heartworm prevalence. To help pet parents and veterinarians monitor heartworm prevalence in their community, CAPC provides a monthly, county-by-county heartworm disease forecast. Read about the effect of traveling with dogs and the spread of heartworm disease in Have Dog, Will Travel. Download informative client handouts on heartworm disease in dogs and cats.